Elmer sums up the demo in four words: "Oh My Freaking God"
It is difficult to properly express the sheer magnitude of AWESOME that was my first play through with Ready At Dawns God of War without resorting to juvenile exclamations like OMFG or the like. But hyperbole like "This is the most amazing achievement I've seen all year!" is not so far from the truth. Attempts to keep any appearance of decorum while talking about this title does it a disservice, this is indeed the most badass f***ing disc to ever hit the PSP. And I am only talking about the demo. Pop it in, boot it up, and after a quick load fans of the series will be familiar with Kratos' stern mug staring you back down. Starting the demo, I am happy to note there is nothing you could honestly call a loading time present anywhere else, the game begins nearly instantaneously. In what is quickly becoming a series staple, Kratos finds himself in a city under siege. Atop a burning tower on the shores of Attica, the camera pans from Kratos, who was then a champion of Ares, towards a smoky dawn and the Aegean Sea lined with ships from an invading Persian army. Their soldiers are climbing the tower, they are your first victims. It is an incredible experience for the tiny screen, easily worthy of its elder brothers on the PS2. With a decent set of headphones on listening to the great sound and phenomenal score, it's nothing short of epic. The controls are virtually complete with nothing spared in terms of responsiveness and brutality. 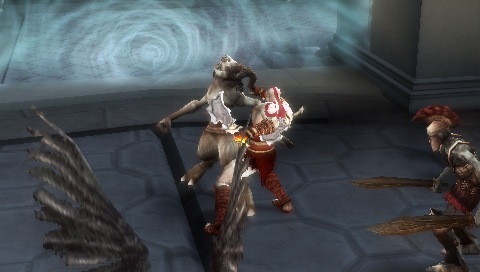 Kratos is, as always, an engaging avatar representative of horrible rage and power. The only two concessions are that only one kind of grab is available to you (for the demo I would presume), and that dodging must be handled without the assistance of a second analog stick. Dodging is now done by holding the L and R triggers then pushing a directing on the analog nub. It becomes second nature quickly and is hardly disruptive to the flow of combat as L is already the defense trigger. Without missing a beat, I was already pulling off the same massive combos that were very well familiar to me. The soldiers were ants in the face of my wrath. Oh no doubt the enemies can be tricky, but any veteran of the previous games should have no trouble clearing hordes of the baddies available in the demo. Something had to be done about those ships. Fortunately the properly aimed and loaded ballista sitting at the corner would do just perfectly. In that non obtrusive way you're introduced to the often necessary series of button presses and analog nub waggles that do everything from open doors to firing ballistas. Speaking of opening doors, it's almost always exciting in a God of War and the demo proved no differently. 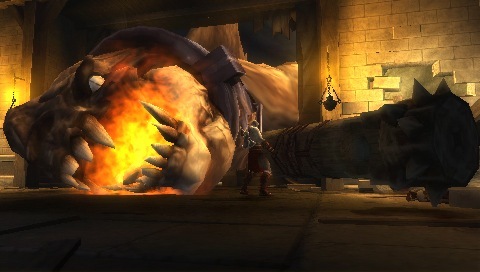 Seeing a large door prompted Kratos to use his strength to open it, these feats of strength are always translated to the player via the rapid mashing of the circle button. But before the door is open a god damned cyclops breaks in and wants to crush you with a pillar it found. Press circle harder! Then after knocking him back, the entire wall is crushed as a giant freaking Godzilla-esque monster with a jaw the size of a bus EATS the cyclops! And all you wanted to do was open a door! What would God of War be if it weren't for memorable bosses, and though this "Basilisk" (a Basilisk in name only as I'm pretty sure they don't shoot fireballs) isn't exactly on par with fighting the Colossus of Rhodes he certainly is no slouch when it comes to intimidation. Being an early boss, he could be forgiven for predictability but it comes are perfect comfort to see that the team knows what they're doing. It's the combinations of understanding the bosses pattern and using Kratos' agility to out maneuver these epic creatures that God of War has always done so very well. After diminishing their health enough the game rewards you as much as it challenges you with cinematic quick time events to finish the monster off. And by golly does it ever feel good. And about those cinematics, oh man are they still here. Encountering a Persian king before he defiles the city's women, we're privy to the kind of deathly epic dialog that makes every scene in the series a reason to stay glued to the story. In almost any other game set in any other era, the kind of high drama and grandiose proclamations of gods and wrath could be construed as silly. But in the great world of Greek Mythology, hooboy it makes for great stuff. Fans will be glad to hear Kratos voice actor T.C. Carson is on the job again and hearing him as the Ghost of Sparta clinched it for me. If Ready at Dawn is going to deliver an entire game of this, without compromise or sacrifice, then my friends we have a real hit coming our way. Hell, even the demo disc comes with bonus features! Now excuse me while I get back and play this thing again. And again. And again.